The iconic Seaholm Power Plant lends its name to the entire Seaholm EcoDistrict and symbolizes the revitalization of this prominent area in the heart of downtown Austin. 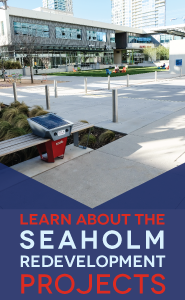 Restoration of the power plant created a ripple effect of sustainable development surrounding the site and today the Seaholm EcoDistrict is a vibrant hub of residential, office, and community gathering spaces that reflects Austin’s spirit of originality and soul. The 90-acre EcoDistrict exhibits Austin’s commitment to sustainable urban living and contains green features that are good for the environment and people who, live, work or play here. Want to learn more? 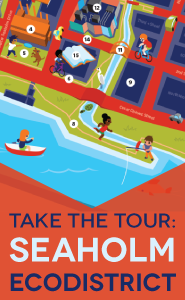 Take the tour!